When writing a resume, there are many things you need to keep in mind. However, all resume writing tips are not equal. Some are more important than others. 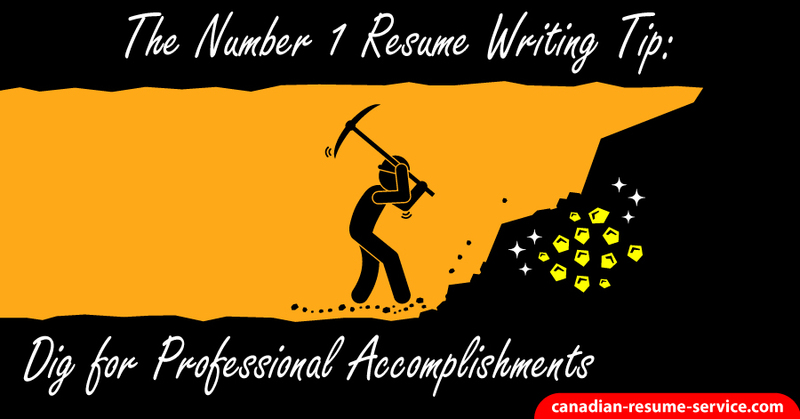 And the number one tip for resume writing is ensuring that you dig for your professional accomplishments. So, if you take away only one piece of advice concerning resume writing, it’s this: discover and communicate evidence to back up your strengths, skills, and abilities as a professional in your field. As you embark on the road of resume writing, you will find it may be a daunting task. There are so many things to learn, remember, do, and not do, that it is easy to feel overwhelmed and frustrated. However, if there is only one piece of advice you must remember, it is this: uncover and effectively communicate relevant career accomplishments that highlight your most critical core competencies that will bring value to the organization. As a resume writer of 16 years, I have seen a ton of resumes that individuals have written themselves and they don’t include accomplishments. They list their duties and skills, but no evidence as to how they performed those duties or skills, or what results they achieved for the companies where they were employed. Effective resume writing requires you to think about your past and what you did to add value to the organization where you worked. Even if you are a new graduate, you can still have accomplishments to highlight in part-time jobs, volunteer work, or during your academic studies. I often see some professionals struggle more than others to come up with accomplishments in their jobs. People who work in office administration, bookkeeping or accounting, teaching, retail, customer service, and oil and gas are just a few of the fields where professionals struggle to uncover accomplishments. If you are writing an executive resume you will need to communicate your leadership accomplishments to generate an interview. Professional accomplishments are things you have succeeded at in your job. They are concrete and identifiable results that have provided value to the company or organization. These achievements focus on the skills and talents you have used to move the department or organization forward. • Implemented a new system to help streamline operations; thus boosting productivity and efficiency within the workplace. • Created and implemented a new marketing program to recruit new clients. • Forged strong relationships with international clients to penetrate the global market. • Sourced different sub-contractors to reduce material cost. • Trained colleagues on a new software program, which took time and patience to learn. • Received a promotion due to hard work, resilience, top-notch skills, and holding an unwavering commitment to the company. Why is it necessary to include professional accomplishments on a resume? Incorporating job-related achievements in your resume and cover letter is essential for getting your job search documents noticed! Related accomplishments will set you apart from your competition because they concretely demonstrate your skills and worth, and prove to the employer that you would be a valuable candidate for the job. They also pique the reader’s interest and prompt him or her to offer you a job interview. How do you dig for professional accomplishments? Sometimes it can be easy to come up with work-related achievements; other times, you have to dig deep and get creative in your thinking. If there is an accomplishment that stands out immediately, that is fantastic – write it down! However, you will want to include several of them, so you may need to take the time to sit down and think. One of the best ways to come up with professional accomplishments is to write down a list of your hard and soft skills. Hard skills are industry-related skills, and soft skills focus more on personality traits and personal competencies, such as problem-solving, analysis, time management, communication, interpersonal skills, organization, etc. 2. you will be prepared for a BDI if that is the type of conversation you encounter in a job hiring screening session. So how exactly do you attempt to answer a BDI question? Don’t let a Behavioral Descriptive Interview or the process intimidate you! The simplest way to come up with answers to potential questions is by using the CAR acronym: Challenge, Action, and Result. • Think of a situation where you faced a Challenge or problem. • What was the Result? What skill did you utilize or demonstrate? By using the CAR acronym, you will be able to answer the proposed question entirely, while also demonstrating one of your beneficial talents or skills. What is the proper way to write or incorporate professional accomplishments in your resume? After you have come up with professional accomplishments or used BDI questions to uncover them, you need to write them in proper sentence format. You must also flesh out the details of the actions you took. • Researched and sourced new suppliers to land a more cost-efficient contract. Utilized excellent negotiation skills to decrease fees even further, resulting in a 25% reduction in supply costs, as opposed to the original target of 20%. • Researched marketing trends and demographics to design and implement an effective marketing strategy. Worked on brand development and exposure to penetrate a different demographic; thus boosting clientele base by almost 30% over a three-month period. • Forged strong relationships with high-level clients to land new accounts. Implemented new procedures to streamline operations, reducing downtime and increasing output to meet demands of a larger customer base. Raised company profits by $600K from 2015-2016 as a result. Incorporate as many facts and figures as possible. Numbers help break down the data, and are easy for the reader to understand, for example. 75% or $1.5M are perceptible concepts for any hiring manager and provide concrete details about what you accomplished. After integrating your professional accomplishments into your resume, make sure you do the same in your cover letter. Ask yourself this question: is your resume grabbing attention for the right reasons? If the answer is no, it’s time to take a different approach to creating your resume to ensure you land job interviews. If you found these resume writing tips valuable, I would appreciate you commenting and sharing this post with others!